Well, I made to Savannah, with barely a glance at my expired driver's license. hmmmph...security. The weather is so nice. My husband, Jeff, is out golfing with my daughter's boyfriend right now and I'm relaxing reading over my favorite art blogs. I haven't taken a ton of pictures yet. Just here and there. Savannah GA is known for its eccentrics and I'll leave you with a photo of one of their most famous. This guy is one to be avoided. He's very confrontational and rude. People have started dressing up like him for Halloween! 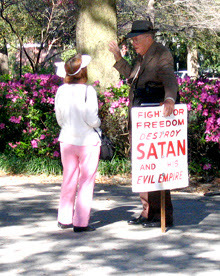 He carries another sign that I remember when I first started coming to Savannah. It says, "Stop the Lie." Maybe, I'll go for a walk soon with my camera. Get some pics of the locals.